Let me start with a few housekeeping matters. Firstly, the bypass is still on track and in fact by way of an update the Cabinet last year approved the submission for the bypass to proceed. The submission for funding is now with the China Exim bank awaiting their approval but we’ve started the development of the final plans and designs. Stanley Construction and CHEC are doing that part of the work and so next year we will have a brand-new start, the brand-new bypass for Montego Bay which will significantly ease the traffic congestion and certainly improve the ease and speed of doing business in Montego Bay. So, Mark, I will at that time be one hour early for the next building that you’re opening. The other housekeeping matter which shouldn’t be reduced to housekeeping because it is probably on the minds of all Montegonians is that at the end of this month the state of public emergency will expire. It is amazing that when we started this strategy, the use of enhanced security powers, persons were nervous, apprehensive even fearful of how it would affect business and life in general. Now coming to its expiration people are indeed apprehensive, nervous and fearful of what life will be like after this measure expires. I want to give the assurance to people Of Montego Bay that the government will continue to be resolute and relentlessness in its pursuit of your safety, security and indeed the peace of your communities. We will use all measure within the law with respect to human rights and the dignity of the person to ensure that your community remains safe. Create and support the conditions for private sector lead growth. To create meaningful employment for all Jamaicans but the broader picture is to ensure that all Jamaicans are involved in work. To ensure the security and safety and peace of communities and households within Jamaica and all of these lead into the ultimate objective of securing Jamaica’s economic independence. I believe that if you assess the performance of the government on its lines of effort you will come to the conclusion that the government can report significant success, for example, there is no question that the government has achieved major success in ensuring the fiscal certainty of our economy. The debt has been reduced from 141% of GDP to this year we will be just below 100% of GDP and that is the ultimate index but there are other things that we should measure fiscal performance on and that is, for example, the government has seen significant investments in the development of infrastructure but a large part of that does not rely on the government’s fiscal accounts. In other words, we have pursued the expansion of infrastructure and capital formation without having to rely on the budget of the government. Now, this is a perfect example. The PAJ out of its own resources, that is the Port Authority of Jamaica, out of its own resources have made this investment and this investment will bring a financial windfall maybe windfall is too much but certainly profit that you can use to reinvest but the policy of the government is that all its public bodies must stand financially sound and fiscally certain on their own and all the assets that we have must see to their full utilization so all the warehouses that are empty, all the parking lots that are now volleyball and football fields, all the real estate that are unoccupied and unused, all the lands that are just growing wild bush we must find appropriate and high-value usage for them and that strategy has worked and I want to commend the Port Authority of Jamaica in being at the lead in fulfilling that strategy in ensuring that our port facilities are being developed, in ensuring that our BPO facilities, those that exist and the new ones that are being developed and whilst this facility may be the most modern in the Port Authority’s portfolio of BPO facilities, I happen to know that the work in Portmore, the Portmore Informatics Park, (PIP), that that will be an ultramodern facility and will probably eclipse what is being done here and there are other developments to come. I see in the audience the chairman of the Factories Corporation of Jamaica, Mr Lyttleton Shirley but you will probably know him more as ‘ Tanny’ and there are two major plans, Morant Bay- the former Goodyear factory, again another asset that laid there for many years un-utilized that is on its way and in Portmore again another facility that is going to be developed which will provide space for the business process outsourcing centre; all of which are being done without call on the government’s budget. I raised that to say that in as much as we are pushing forward to see the development of the infrastructure and supporting capital formation without a call on the government budget. I mean the government has to have some involvement but where these things are commercial in nature we believe that it should be the private sector or corporately operated public agencies that do them but the government must also look at the landscape and look to the horizon because I’ve often said that the ship of state is almost like a submarine, it’s undersea it doesn’t always see the big picture or the horizon and so it has to have a periscope that looks up above the water and can see what is to come. Governments have to analyse future risks, so we’re making investments now but one thing of which we are certain is that conditions will change. They can change for the better, or they can change for the worst. One thing we must ensure is that whatever the change that occurs, Jamaica is in a position to survive and be resilient, that is being able to recover very quickly from adverse change or take advantage of opportunities that present themselves and so the government must always be forward looking and in that forward looking stance the government must say what are the risks that are on the horizon for our fiscal certainty; what are the risks that could cause the government to have to for example put on more taxes on people, what are the risks for example that could cause the government to incur more debt and from now try to avoid those risks. Our strategy of ensuring that the private sector along with corporately run public agencies take on the risks of developing infrastructure and capital formation, that strategy works for the people of Jamaica because it ensures that at no time will there be a call on you the public to pay for any eventualities that may happen and that paying for means; either higher taxes or we have to cut services and so it is with another national asset for example PetroJam. In its present state PetroJam is a fiscal risk to the government. The truth is that after the JPS ceases to be its major customer by virtue of a decision that the government made to diversify its fuel mix to include LNG, which is more stable fuel in terms of its commodity pricing and probably better in the long run for Jamaica and a more efficient fuel from an environmental perspective, we took that decision. When we took that decision, we should have also considered the other impacts of that decision which means that PetroJam could lose or will lose 50% of its custom. That could very well mean that the operations of PetroJam could become a call on the government and I use the term government, but I shouldn’t because in the consciousness of Jamaica the Jamaican people see the government as separate from them which is not the case. The government is just the accumulation of you so if it’s a call on the government’s purse, government’s purse is a collection from your pockets and that’s what it is. It is going to be a call on your pocket. I’m not running a government that is undersea not knowing what is coming in the future; as we’ve had governments do in the past and then we happen upon situations and those who are being critical of the government now should explain why it is we are happening up on situations that are creating fiscal risks for the government. 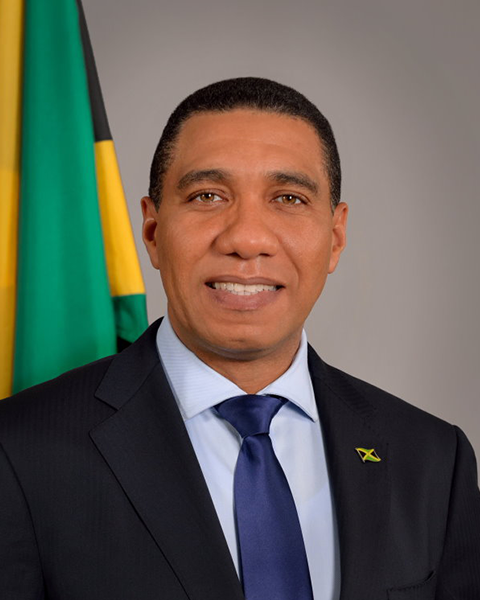 This government is giving the people of Jamaica the commitment that we will not just manage the situations that exist now, but we are managing the situations to come, and you can be assured that the government I lead will always make decisions in the interest of the Jamaican people first. You may be wondering what’s the connection but I hope you see that the strategy of the government in doing all of this is about this line of effort in ensuring that Jamaica’s government meaning the collection of your pockets is fiscally sound but you would also agree that on the line of effort of creating employment that the government has done exceptionally well; 1.3 million Jamaicans are employed. That’s the highest number since the recorded history of the statistics. Now, that’s a commitment we made, and we intend to continue to push for greater employment because I believe we can reach full employment and we’re not far away from it, but I’ll say a few things about the government’s strategy on employment. The first thing is that we recognize that training and education is a constraint on our growth and employment process. Kind of ironic isn’t it but it is the truth. Our education system, its output, our socialization coming from our households are all impacting on the rate at which we increase our employment. I have here today of course the chairman of HEART, Mr Edward Gabbidon and he knows that I’ve been breathing down the neck of HEART to put in place an effective strategy of training persons for the BPO industry. I know that they have an effort underway and it has made an impact but I’m always concerned when I hear of situations that a BPO enterprise opened just a few doors down and then the BPO enterprise that was always in existence would come to work on a Monday morning and half its staff is gone over to the next BPO and they are in a quandary and a scurry trying to find replacements. We hear those stories and the government takes it seriously. We must rapidly increase our training to support the expansion of the industry. It can’t be that we have investors here and we are not supplying very quickly the quality trained workers. We have to get cracking on that in a more aggressive way and it is not that we don’t have the people. You know where they are? Some of them are in lottery scamming, some of them are in crime and many of them are at home sitting down doing nothing and when you go to them “well… mi can’t leave mi baby” or they hide because I’ve seen the reports. We’ve gone into communities with programmes offering people to be trained and they refuse to take it. Why? It is clear that the policy of the government can’t be just employment, the policy of the government has to be to create a culture of work. Two different things; work and employment. Employment can only happen in a significant way when there is a culture of where people appreciate the value of their labour so it’s not just the employer that must appreciate the value of labour, people themselves and that culture is not always fully spread in the population and so an agency like HEART has to configure its programme to address this issue as to why it is some our people just don’t want to work and frown upon work and I hear it coming through in some of the criticisms of the BPO industry and I would rebuke those criticisms. The truth is that you have to start somewhere, and we must recognize that it is better to be employed than to be out there doing nothing becoming candidates for all kinds of nefarious activities. Another point to note about the industry and speaking frankly to this audience and as a part of our periscope looking at the future and analysing risks, we the government are very ceased and understand that this industry is susceptible to rapid change. My view is that the industry will not go away but it will be transformed. Artificial intelligence will transform the industry, so Jamaica cannot rest comfortably at the level that it is in the industry. It must increase its performance levels from merely being telephone operators to absorb more of the high value skills so it has to move now significantly and rapidly from the business process engineering and development to more the knowledge process and we can measure how that transformation is going when the company that said ‘look I have eleven persons, eight of whom are programmers, and we’re the smallest’, ten years’ time when I’m back here I want to hear that that company is now the largest, that we have more people doing the development, doing the programming, doing the designs so I’m giving a charge now to the BPO industry and to HEART/NTA that we cannot remain at the level at which we are in the industry. As I’ve said, the industry will not go away, it will not die, but it will transform and if we don’t transform we will lose the industry. As it relates to creating a supportive environment for the business sector so that we can achieve growth, we were not pleased with the last report of the ease of doing business. It’s not that we’ve fallen behind because we weren’t doing what we should be doing. What has happened is that other countries have moved faster than we have, and I want to close by just saying a few words on the speed of doing business. Jamaica must always remember that we are in a competitive space. We tend to have a sense of exceptionalism about ourselves, we’re the fastest people, we’re the most creative, and other countries are quietly looking on and using our brand when we are not, becoming more discipline when we reject discipline, becoming more orderly when we reject order, getting their society safer when we are arguing about how to do that and investors are looking on and saying well what I will do is, I will come to Jamaica for the beach but I will go elsewhere for the investment and then even at that point people are saying, well, you know what it’s too confusing, let me go elsewhere even if the beach is good. We must as a country reach a point where we conclude on certain things. We must conclude that we have to give priority to business and investment and we must become efficient in how we give our approvals. It took us about eighteen months to do this. I’m certain it could have been done much faster. We have to start looking at our own business processes and eliminate the things from it that are unnecessary that make no sense anymore in the grand scheme of things then we have to reach a consensus about how we’re going to secure our nation because all of what we’re doing, all the lines of effort about increasing employment and creating growth and being speedy with business all depend on how people feel safe and until we have consensus on that, then all the gains that we make are easily reversed. I want to thank you because if you let me, I’ll go on and on and on, but I want to thank you for being such a good audience and for listening and again let me congratulate the PAJ and the team for bringing this project to fruition. I gather now you would be above ten thousand six hundred persons employed here and that the BPO sector in terms of its employment is now in excess of thirty-six thousand persons. I’m certain that before the year is out we should be close to forty if not passing it. My view and I continue to maintain it, is that we could have hundreds of thousands of persons employed in the BPO sector providing we can release the constraint of the trained labour force and build out the spaces. As it has turned out, it has been easier to build out the spaces than to relieve the constraint of employment, but I give the assurance that we are working on both. God bless you all, happy new year, health, prosperity, happiness and peace.